The M3 Convertible, with a folding metal roof which only takes 22 seconds to open or close. 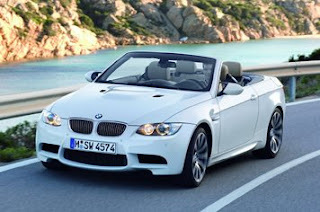 The convertible is 230kg’s heavier than the usual M3, which only takes half a second off its 0-60mph time. The car has paddles on the steering wheel to over-ride the gearbox when it is set in automatic mode. The car also has a Sport mode and a full manual mode. The car become more lively when in sport mode and it stays in the gears for much longer. The car also has launch control which is set by the sport function. The peak for the power is at 8300rpm, so the car has long gears, but it is very powerful. The M3 is 30 per cent more stiff on the road when the metal roof is on compared to the fabric roof models. The car has 414bhp being pushed out of its 4.0-litre V8 BMW engine. 0-62 in only 5.3 seconds. The price for the car is about Â£54,000. Auto insurance quotes would be about the same price as the M3 Coupe. Add some BMW M3 Wheels to your Beamer from WheelHQ.com. Auto Insurance: Auto insurance quotes similar to M3 Coupe.